So I’m asking for your thoughts and advice, both general and specific. Yes. I know there are other great platforms. But I need to narrow the choices. I’m comfortable with WordPress, and there’s plenty to choose from. And that’s the problem: There are so many decent WordPress themes, and so many providers, I hardy know where to begin. Of course, WordPress will accommodate just about any functionality. But are some themes better at what I need? I need a blog that’s optimized for social. It should encourage social sharing, following and commenting. 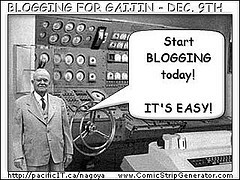 My current blog offers this stuff, but it doesn’t really encourage it. For example, it practically hides the fact that you can comment. Fail! The design should be professional and simple. It should direct attention to the content, not the design. Navigation should be simple and complete, so that if someone likes a particular post or page, they might be encouraged to find another one. It should be easy to read. My current theme defaults to an unreadable gray font. Fail! It should reflect professionalism. A little style wouldn’t hurt, but nothing gratuitous. It should be good for marketing. I’d like to promote and offer reports or ebooks, collect information and automate responses. I’d like to have some control over the response format. It should be technically flawless. It should load fast. And be solid as a rock. Updates should be painless. Maybe that means it needs to come from a particular provider. Maybe all of these things are just WordPress features by definition. I’m not sure. If you have an opinion, you’re an expert in my book. Now, I don’t care if you’re an ace developer or just someone who just has an opinion or a suggestion based on limited experience or personal preference. If you have any advice or opinions, I’m all ears. Tell me what you like, what works, or what doesn’t. And if we collect a lot of good ideas, I’ll package them up in a nice document to share with everyone who’s interested. This entry was posted in Inbound marketing, Social media for business and tagged blog functionality, blog requirements, Blogging, marketing blog, upgrading a blog, WordPress, WordPress theme by barrett. Bookmark the permalink. Studiopress’ “Genesis” is the dominant premium theme right now. Headway and Pagelines are pretty good too but they require a lot more configuration and design work. You might see people recommending Thesis online but they are all affiliates trying to make a buck – it used to be okay but it has fallen dramatically behind and the devs are… “uncooperative” with plugin authors. If you want to get into nuts-and-bolts there are a lot of good open-source frameworks out there but I’m assuming you don’t want to code? I can get coding help, but no, I don’t want to code. Thanks for the overview, AC, much appreciated. So it looks you’re referring to the Genesis framework, not a particular theme, correct? The Genesis Theme is kind of barebones. Which might be good for some folks. Seriously? You want my advice on this? I’m still ‘free’ after 18 mos….. I will say I hear WordPress is the bomb though; I would stay with it. WordPress also has access to plenty of themes as well; I’m sure you can find an appropriate one for a ‘business’ blog. Kaarina and I were just having this conversation, on how people post similar topics at the same time as I have something coming out next week along the same lines. It will be interesting to see your feedback; I might incorporate some of the info into what I’m looking for. Did I hear my name being called? Thanks Bill and Kaarina. There’s not a reason in the world for me to switch from WordPress, so that’s not an issue. At one point, I used this current theme hosted at WordPress.com. Then I switched to a self-hosted set-up, using the same theme. It’s called “Elegant Grunge” and it feels like a beautiful old library book, but it’s starting to get a bit musty… If you think of any features or functions that you don’t have currently, that I ought to consider, let me know. Stop it…….that’s all the questions I’m asking….. I recommend Genesis. Genesis offers several themes that build on the basic framework. Thesis is a good choice, too, but I like Genesis better. The themes with Genesis usually have a couple of variations in case you don’t want to dig into the CSS (Don’t do it unless you’re a crazy person like me. ), and the themes and framework are robust. I know a new theme is slated to be released, but I’m not sure of the time frame. I’m using the Balance theme. I doubt I’ll change to the new theme unless it’s really spectacular, and I can convince my budget to fork over the money for the theme. All right, I’m off to look at Genesis. Any thoughts on identifying good blogging themes that are great with the social stuff? Hmm. All the themes work well with social, and Genesis makes it super simple with its Simple Social Plugin. I think that’s what it’s called. I didn’t use that plugin because I’m hardheaded and chose the CSS/image sprite/custom menu route. I have no idea how I figured all that out. Balance and Generate might be two themes that would interest you. They have a simple layout, and they’re designed to push people to take some sort of action – usually signing up for an e-letter or subscribing to the blog. As to the commenting platforms, Livefyre and DISQS seem about equal. DISQS has some new features that I like, but I’m pretty content with Livefyre. I’m happy to chat, too, but Jason probably knows more than I do about a lot of this stuff. Give the Genesis framework a look – I’ve recently had the switch from Thesis to Genesis and I’m running the Balance child theme. Responsive design with lots of power under the hood. Happy to chat with you about this, Barrett. Just say the word. Thanks Jason. Ditto what I told Erin. I may be in touch for some pointers, but probably not today. What specifically do you think are the most important things I should look at, given my requirements? Any thoughts on livefyre, commentluv or Disqus? I swear, I had to look up BOLO! I’m told that Theme Forest is a good source also, if budget is tight. And there are also tons of completely free themes at WordPress.org. But I’m willing to spend a few bucks, anyway. Genesis costs a bit more but the price is still so low for something I’ll be using for a while that it’s not a big concern. I would definitely consider a responsive theme. With the growth of device types and screen sizes reaching users keeps getting tougher and a well designed responsive theme will go along way to doing that. It’s great to have a pro’s advice Ryan. There are a few Genesis templates that are pretty close to what I’m looking for. So I’m taking everyone’s advice very seriously. Do you, or anyone else, have a good theme source to recommend?